Drive down the 1132 and you’ll find the rustic fishing village of Bukchon. Meander through the village’s narrow windy roads lined with black volcanic rock walls and you might stumble upon an old house with a small wooden sign marked “코삿 헌.” This is the entrance to the restaurant Cossat, a name that means good feeling in Jeju’s local language. Inside you’ll spy white plaster walls and bare wooden beams supporting the ceiling. 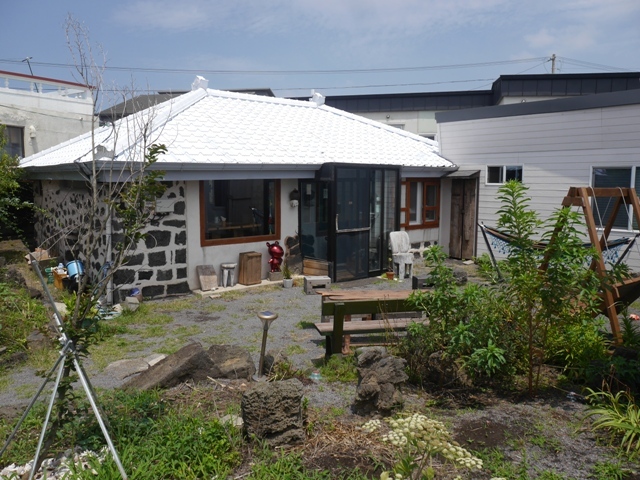 Owner Kim Eun-young says that as the dwelling was built in 1958, she has done her best to preserve the structure’s original design. She emphasizes the skill of the principal builder’s craft work, pointing out the remaining black markings on the wooden beams that the builder clearly used to keep organized. Leaves that fell and got stuck while the plaster was still drying can even be seen poking out of the walls. All these years later and these special details remain. Scattered about in the many nooks and crannies of the building are knick knacks and books. Colorful paintings and photographs hang from the walls while folk music plays in the background creating a calm, yet playful mood inside the cafe. It looks like a place Kim has been settled in for a long time. Each item in the restaurant seems to have a special location and she moves around the building with ease. However, Cossat is relatively new, having only opened about a year and a half ago. How Kim ended up opening a restaurant here is an interesting tale. Originally trained in design, she started casually experimenting with cooking. 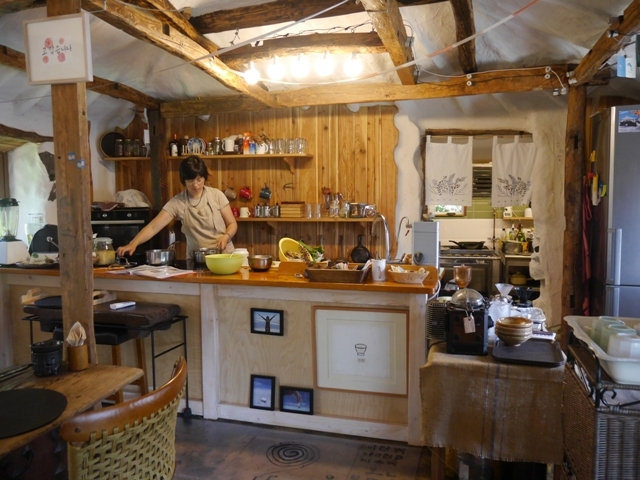 It began with classes from TV-famous cooking master Moon Sung-hee, who visits Jeju once every season to preach her natural food philosophies and instruct on cooking techniques. Her mentor’s culinary style relies primarily on the freshness of unprocessed ingredients gathered from local areas. Moon espouses the importance of filling your body with sunlight by eating lots of plants. She believes that through eating, you can absorb the vibrations and energy of living things. Soon after taking Moon’s course, Kim found herself thinking about cooking more often than doing her art. Indeed, she probably had to be thinking about cooking since she creates every component of her recipes from scratch, even the sauces normally bought at the supermarket. She found it refreshing to break away from mass-produced products and hone in on her skills. Her passion grew and grew until she arrived at the truth that preparing the food was just one step in the cooking ritual, and without sharing, that ritual was incomplete. Thus began her time at her very own one-table cafe at a Hamdeok bread and breakfast where she first sold her food to delighted customers. Kim has followed Moon’s lead in emphasizing health and well-being, but she has brought her own flair to her cooking signature, taking inspiration from both her international travels and Jeju-native plant species. Following the Slow Food movement, Kim’s approach towards food preparation is very community-based, if not familial. While she cooks, she takes pleasure in chatting with customers about the dishes, and she strives to meet a diverse variety of people in order to come into contact with new inspiration for her creations. As she has traveled far and wide, she incorporates South American, Mediterranean, and Japanese styles in her meals. While internationally minded, as someone from Jeju, Kim recognizes the tragedy of wisdom lost with the passing away of each farmer who has cultivated and collected the seeds of heirloom species that can only be found here on Jeju Island. She is a part of a growing effort to collect this historical knowledge and preserve the seeds. Using plants from her own garden and buying the rest of her ingredients from neighborhood grandmas, she works with their flavors to make her own eclectic dishes. It’s not difficult to see how Kim’s food stands as a metaphor for Jeju’s state of affairs. Ever since becoming an international destination for travelers, the true value of Jeju is still found in its unique history and culture. It is vital that while mixing the global with the local, the local is preserved as the essential piece, and you can see that is precisely what Kim works towards with each dish she makes. Today she is making quite a spread: fish soup, pumpkin leaf soup, shark, chicken, dried pollack, and a soy sauce based soup. The aromas swirling around in the air are intoxicating. What’s more, every day she concocts something new. In fact, there is no set menu. Customers call in to see what the dish of the day is and make reservations, creating an intimate and custom dining experience every time. “More than anything, it’s fun!” Kim proclaims. Call 010-6599-1800 to see what’s cooking today and let the honesty of the fresh ingredients overwhelm you. Also, delight in mouth-watering images by following them on Instagram.